» If sardines could fly, would they? If sardines could fly, would they? Economy seating on a Boeing 747, last year. Now we’ve all heard of another cases of a passenger plane being diverted because of trouble among the passengers. This kind of thing has become more common, and the reason is that like sheep, people keep subjecting themselves to inhuman conditions on planes. The last time I was on a plane was almost a year ago, when a family obligation required me to make a quick trip overseas. I’m not about to get on another one any time soon unless conditions on planes drastically improve. This is unlikely because the trend is in the other direction. In the latest case reported in the news, a woman became uset when she was resting her head on the tray table and got hit when the passenger in front reclined his seat. 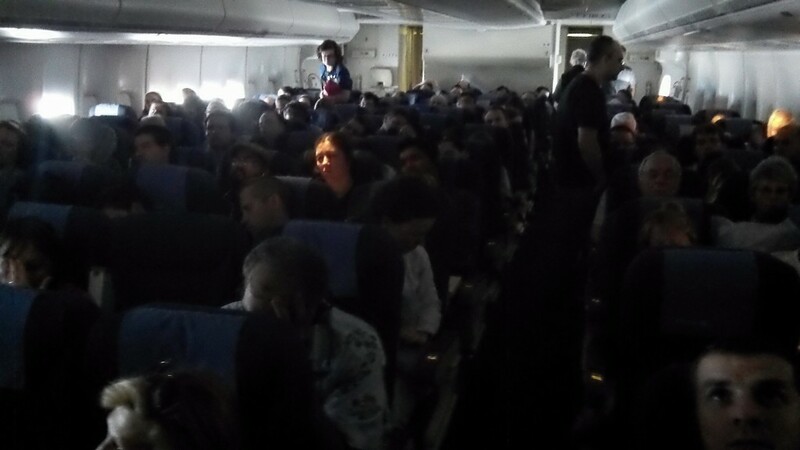 Rude remarks followed, and the plane was diverted to get the offending passengers off. Everybody knows what the problem is. Airlines are reducing the space per passenger in their planes. They want to carry as many people per flight as possible. At the rate they’re going, if regulations allowed it they would soon be selling standing-room-only tickets at cut-rate prices for six-hour flights coast to coast. Why they even equip their alleged seats — perches would be a better term — with reclining backs is hard understand, since the room for reclining has been eliminated. All of this could be fixed in a relatively short time if people quit buying economy tickets. If airlines had to ferry around well-heeled passengers in planes where only the first-class seats are filled, tney would soon see the light. But people still flock to air travel in huge numbers. They all complain about the lousy service and sardine-like accommodations, but they book flights anyway. Hasso, I believe one of the airlines in Ireland has already started selling tickets to passengers who are willing to stand during the short flights from Ireland to Scotland, etc. They have a stool-like seat to rest against.